In this gritty study of a day in the life of three struggling, over-privileged high school grads in New York City in 1982, Lonergan locates the ethos and moral woes of an era just about to hit the fan. With an overall solid cast, the highlight is newcomer Tavi Gevinson, who at 18 is closest in actual age to her character. CHICAGO – Ah, the 1980’s. It was morning in America, and a golden haze of possibility hung low over the hinterlands as the Reagan era dawned. In Manhattan, which seemed to be coming apart at the seams, it was the last days of disco, and teenage offspring of the well-heeled occupied themselves with finding drugs, doing drugs, going to clubs, watching TV, and making the occasional run to Zabar’s for caloric sustenance. Zabar’s at 80th and Broadway remains, but almost everything else depicted in Kenneth Lonergan’s grime-encrusted coming of age tale THIS IS OUR YOUTH has disappeared along with a chapter of New York’s history that now seems about as remote as the 1880’s. And yet these young characters are so recognizable, and their plights so engaging, that two hours with them still provides a probing and very funny night in the theatre. “The proceeds of my unhappy childhood.” Photo: Michael Brosilow. Dennis (Kieran Culikn, 31) is an under-utilized drug dealer taking some time after high school to figure out his next move, which so far consists of little more than changing the channel while smoking pot. It’s the age of white lines, when kids at fancy New England prep schools boarded planes for South America with suitcases full of cash, returning with something special to get the party started. Dennis is a bit of a legend (in his own mind) and skilled at moving coke between supplier and customer, but he’s not that excited about what life has in store. 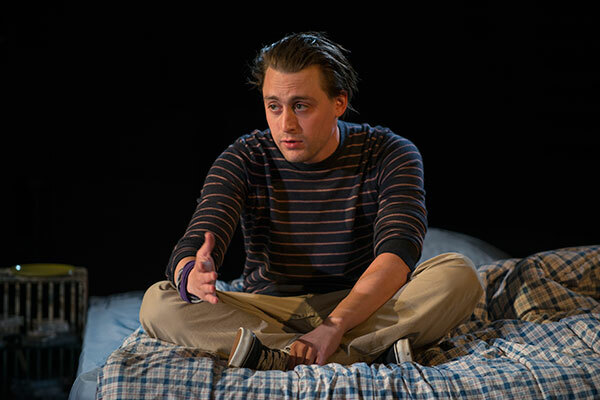 Kieran Culkin is Dennis Zielger. Photo: Michael Brosilow. The plot gets going when newly homeless beta male Warren (Michael Cera, 26) interrupts Dennis’s afternoon of TV and arrives with a suitcase full of cash and childhood toys. Warren has just been evicted by a financially successful but angry father, and to get back at him Warren absconds with $15,000 (a lot of money in 1982) he found lying around. Dennis resents Warren’s intrusion but quickly begins plotting how the two could profitably deploy these resources and also have some fun – possibly, in a flight of imagination, by going to France. Dennis is the uber dog in the teenage rat pack, and Warren is eager for acceptance. But as we will find out, there are limits to what Warren will put up with. 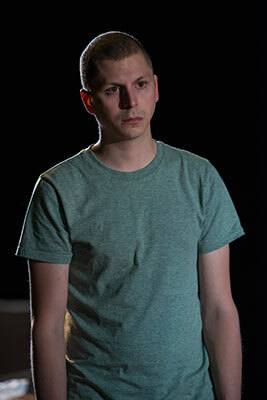 Michael Cera as Warren. On the run from Dad. Photo: Michael Brosilow. And then there is Jessica (Tavi Gevinson, 18), the third and most interesting character, a fashion student who actually has some plans for life and is a friend of Dennis’s girlfriend. As the story goes on we learn that Jessica views herself as on the periphery of the scene, and she has had some bad experiences in the past with other boys in this upper crust world. Warren is interested in Jessica, though he has nary a clue what to do about it, and Dennis sets the two up after savaging Warren for his lack of success with girls. The latter part of act one when Warren and Jessica talk and dance in Dennis’s apartment provides the play’s most touching moment. Tavi Gevinson as Jessica. Photo: Michael Brosilow. As the ringleader and chief verbal assailant, Dennis is mean and hyper smart. Aside from his age, which is pretty far removed from a high school kid, Culkin looks perfect for the role, even if he is at times a little too friendly. He smiles a lot and does not quite have the brutal edge that Dennis’s lines reveal. But with long hair spilling across his face, outfitted in the signature soiled polo shirt avec wrist bands, and full of hilarious raging monologues that self dramatize his poor little rich kid narrative, Culkin makes the most of this meaty, bitter genius role. As Warren, Cera is good at looking and acting awkward, but his blank stares do not always adequately carry this character’s internal state and backstory. He could perhaps be a little more beaten down, a little more miserable. The domineering relationship between Dennis and Warren is somewhat hampered by the fact that Cera is quite the equal in size to Culkin, so without manifesting more of Warren’s psychological state, it’s not clear why he would put up with Dennis’s hectoring and not just slug him. Cera is also quite a bit beyond high school age, though his haircut, slouch, and insecurity help cover up some years. Into this male drug and delusion-fueled battleground comes the show’s real revelation – Tavi Gevinson. 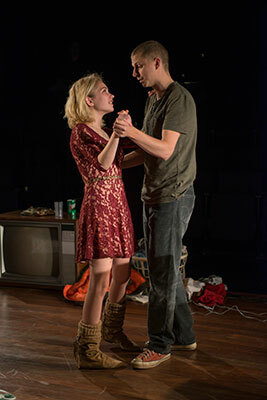 New to the stage, Gevinson has a lot of talent and is very exciting to watch. She really becomes her character, and her own relative lack of experience gives Jessica an even more authentic feel. There’s a great dance sequence when Warren and Jessica start to unwind, and watching each of them work their moves – at separate ends of the apartment at first – is pure joy. Gevinson could go far. Many young actors essentially play themselves. Though she may be doing that here, it just so happens that she is perfect for Jessica, and the energy and presence Gevinson brings makes the show. She is sure to learn a lot in the imminent New York run. We can be heroes, just for one day. Photo: Michael Brosilow. 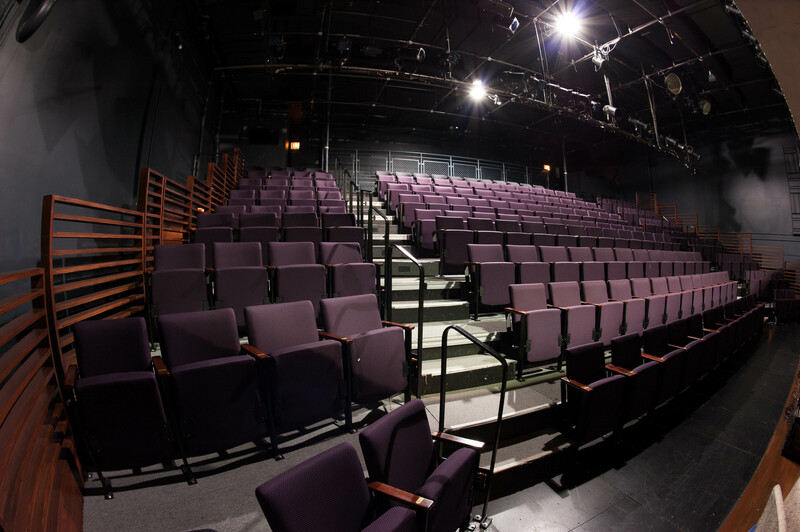 At Steppenwolf, the show is configured in an open central runway with a ramp of seats on either side in the upstairs theatre. This setup gets the audience much closer to the actors than the upcoming Cort Theatre production will. This proximity is important. From a front row seat (where I was lucky enough to be), you can almost smell the decay of ringleader Dennis Ziegler’s minimally furnished apartment. With an old stereo and TV, and one of those skylights that look on the verge of collapse and were seemingly de rigueur in old New York apartments, the milieu perfectly mirrors the harsh, unwelcoming world the three young characters have found themselves thrust into. For New York, the staging will be totally different, and all three are going to need to amp up more. If you recall the original cast of YOUTH (Missy Yager, Mark Ruffalo and Josh Hamilton), who have been immortalized on a must hear 2009 recording of the play by L.A. Theatre Works, you would be forgiven for thinking that no one could ever hope to do a better job. The truth is this is a different production, as it must be in a different era. But it’s still one very much worth seeing. Half the seating for the upstairs staging of THIS IS OUR YOUTH at Steppenwolf. 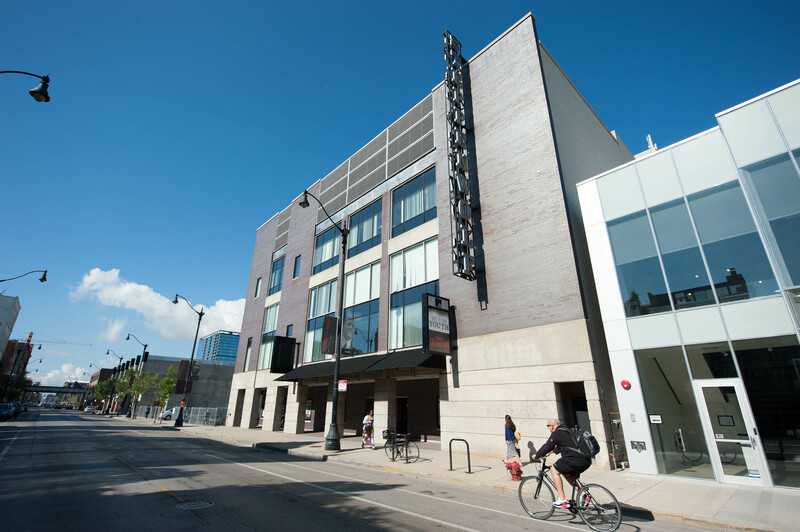 Steppenwolf’s main building on North Halsted Street in Chicago’s Lincoln Park neighborhood.